Living in Portland and all, I couldn’t resist getting in on Violet Craft’s new Waterfront Park line. There are lots of cool prints, but it was the bridges I had to have…those are my bridges! 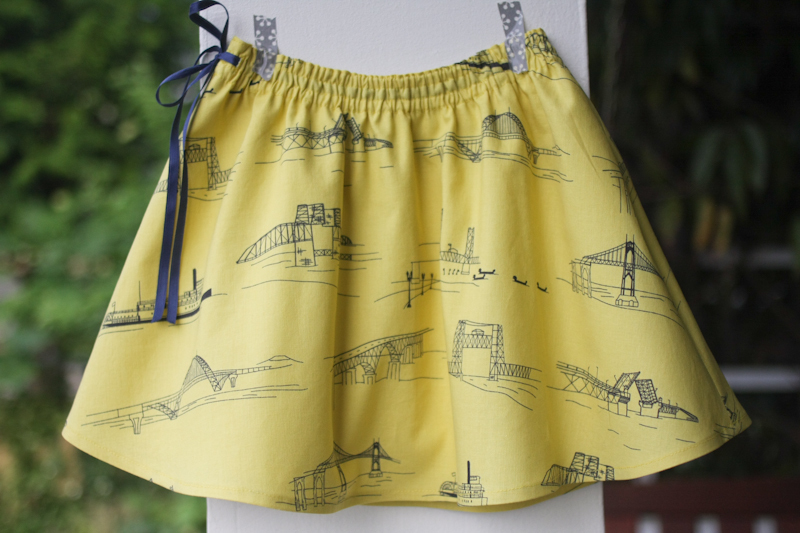 I decided Lila needed a Bridgetown skirt. Immediately. 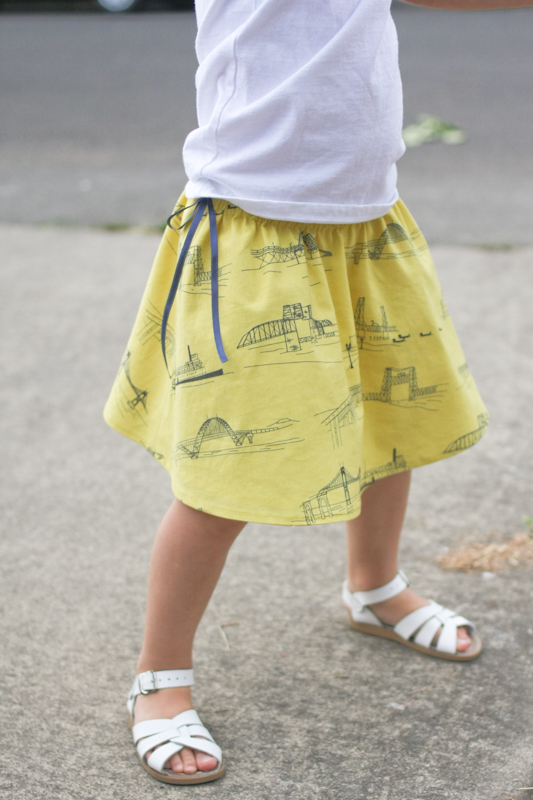 I’m beginning to feel like a bit of a one trick pony with the Oliver + S Swingset skirt. This is my sixth (the most recent batch is here), and I can pretty much make it with my eyes closed now. So I apologize if you’re tired of seeing them, but it remains my favorite skirt pattern for the time being. I love the shape and the fit and the waistband and the full lining and the fact that Lila loves to wear them…I just can’t bring myself to make anything else! I think this one might be my favorite yet. 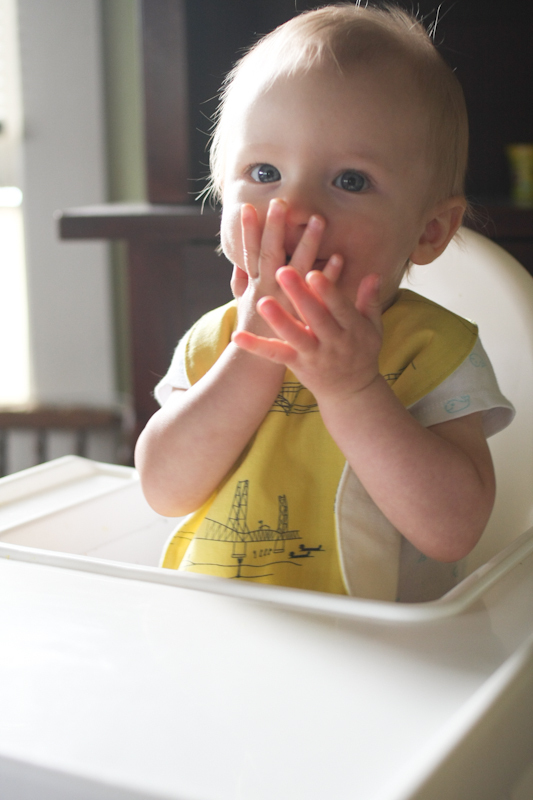 And not to be left out of the fun, Oscar scored a Bridgetown bib. Now he can match his sister while stuffing Cheerios into his mouth. I bought my bridges locally at Fabric Depot, where the whole line is apparently flying off the shelf (Portland pride! ), but my sponsor Llama Fabrics has the Breeze colorway in stock if anyone is looking! I love it! If I had that skirt pattern I think I would just use it for everything too. It’s very sweet and polished, but simple. So cute! I love the material! I love the skirt- keep making ’em! I haven’t seen this fabric line yet, but will definitely check it out… beautiful stuff! cutest skirt EVER! i would die to have one in my size… LOVE IT! Oh, what a great print!!!!! I think it’s the perfect tried-n-true skirt pattern and it always looks fresh and different with every version. 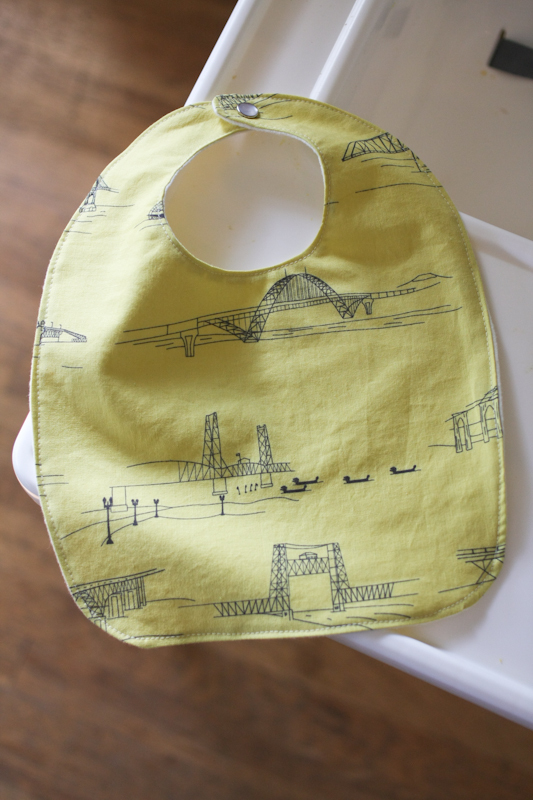 And the bib is too cute for words! Love this whole fabric collection! 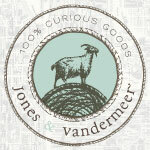 I’m an ex Vancouverite and hold a special place for PDX. Really love it! Perfect fabric, perfect skirt pattern. Why mess with a good thing? I got a few of the other prints as FQs at Bolt but not this one…might need to head back to the Depot. So fun! Oddly enough I’m in Portland with my little family for the first time for a day and a half. The bridges are mesmerizing. Hey! I was going to see if I could get some tips on this pattern! It’s one of my favorite skirts, but I think I did something wrong — is it supposed to be lined and is the “top” fabric supposed to be sewn to the “lining” fabric at the bottom edge of the skirt? Or is that just if you want to make it reversible? hi christen! yes, the skirt is lined, so the main fabric and the lining fabric will just be sewn together at the top – at the bottom you’ll hem the skirt and lining fabrics separately, so they won’t be attached. hope that helps! Perfect, Gail! Thanks!! That’s where I went wrong! I connected at the bottom too 🙂 Thanks so much!! 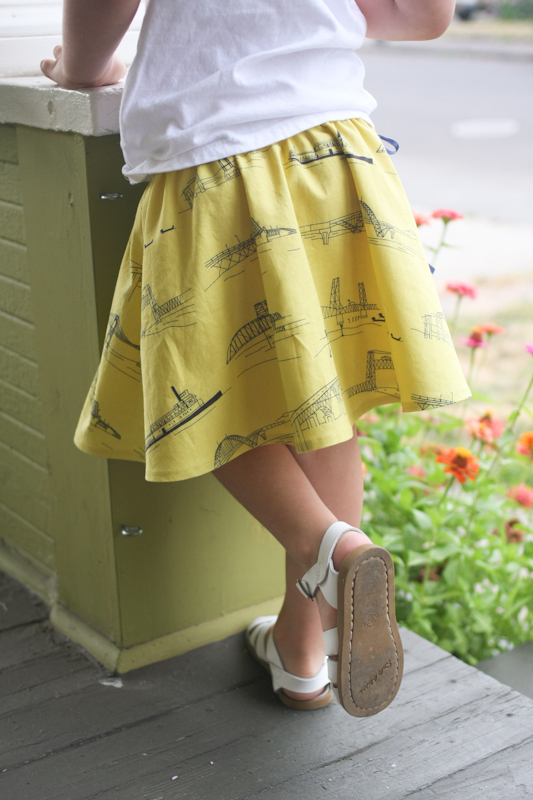 How different is the lazy day pattern from the swingset skirt? 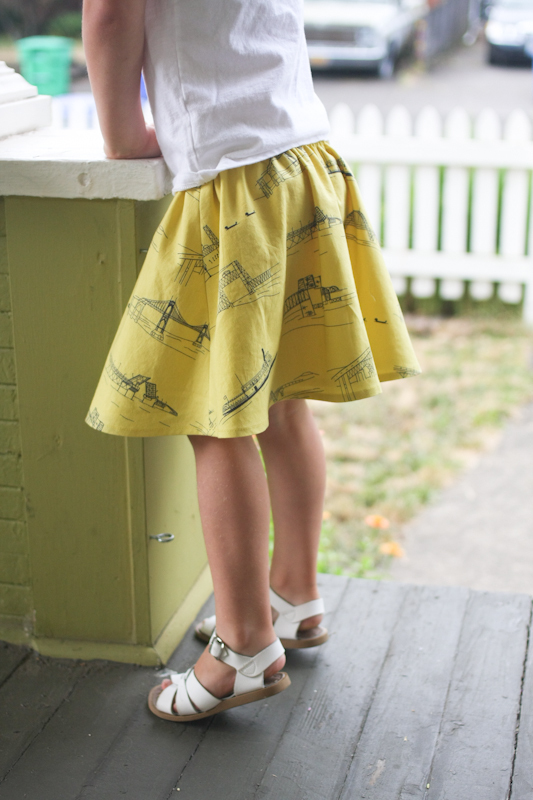 (Other than the swingset skirt being lined) Also, I plan to estimate for my daughter size 7… any tips? Thank you. Beautiful skirt, thanks for sharing your knowledge. I’d say the main difference is that the swingset skirt has a fuller, twirlier shape, whereas the lazy days skirt is cut straight across the width of the fabric, so it hangs a bit straighter. I don’t think you’ll have any trouble sizing up to a 7 – just add a couple inches to the bottom and measure the elastic to fit your daughter’s waist – it’s a very forgiving pattern!